Special clinical interest in urological, breast, skin, lung, gastrointestinal, gynaecological, head and neck, haematology, Stereotactic Ablative Body Radiotherapy (SABR) and Steroetactic Radiosurgery (SRS). 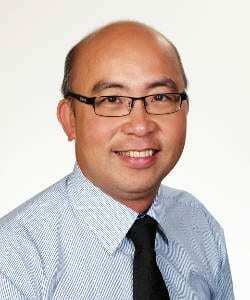 Eddy obtained his MBBS at the University of Queensland in 1995. He then completed his radiation oncology fellowship training in Launceston General Hospital learning new skills in IMRT, VMAT and different types of HDR brachytherapy for prostate, skin, breast and gynaecological malignancies. He has since advanced experience in brachytherapy for prostate (LDR and HDR), skin and gynaecological cancers. He is an active member of HUME RICS (Regional Integrated Cancer Service) and attends clinical governance meetings and multidisciplinary meetings for breast, urology and gastrointestinal at Albury Wodonga Health. He also attends a monthly general multidisciplinary meeting in Wangaratta and has a monthly outpatient clinic there.